I love having a window seat whenever I'm flying into NYC, as the views over Manhattan are simply stunning. Gazing down over the skyline, a 'pinch me' moment results with the realization that I get to live here -- which literally gets me every time. 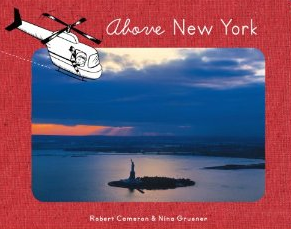 In Above New York, author Nina Gruener celebrates the work of her grandfather, the late photographer Robert Cameron. Cameron is best known for his aerial photography books of famed cities and natural wonders, publishing 19 in total, from Above Paris to Above Yosemite. In an ode to her grandfather, Gruener adapted his photographs of New York City into a children's book about a little boy named Cam discovering the Big Apple for the first time. Not only are the photos beautiful, but the story is filled with whimsy and lovingly celebrates the curious nature of children. I think it's really special that Gruener has chosen to remember her grandfather this way -- and I have no doubt that Cameron and "Cam" would have been kindred spirits. I just love that idea. Great, original way to memorialize a loved one.